Two thirds of Saskatchewan residents support the provincial government taking legal action against the federal government in regard to the Carbon Tax. In a new independent poll conducted by Insightrix Research, Inc., residents were asked whether they support or oppose the Saskatchewan government in taking legal action against the federal government in regard to the federal Greenhouse Gas Pollution Pricing Act (i.e., the carbon tax). Results from this independent survey indicate that one half (51%) of residents strongly support this stance and another 16% somewhat support it. 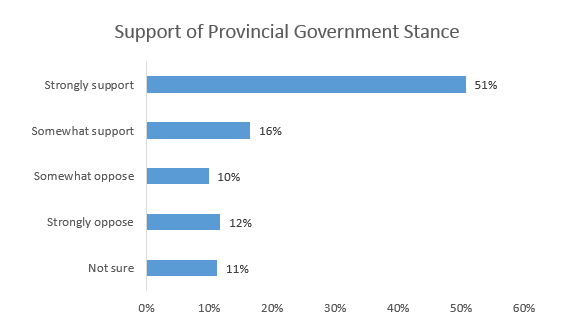 A majority of residents within all age ranges support the provincial government although support rises with age (18-34: 60% support, 35-54: 69% support and 55+: 72% support). Support is lower in Regina (53%) and Saskatoon (57%) than in the remainder of the province (76%). Most of those who support the legal action most commonly believe the Act will result in price increases, have minimal benefit to reducing pollution, be harmful to the provincial economy and simply be one more tax. One half say they do not support the Act because they believe the federal government does not have the right or jurisdiction to impose such a tax. Findings are uniform across demographic variables. Among the 22% who oppose the provincial government stance, most feel the Act will limit environmental impacts caused by industry, while one half feel it would limit impacts caused by consumers, it would be beneficial to the provincial economy or simply feel the federal government has the right to impose such a tax. A total of 801 randomly selected SaskWatch Research® panel members participated in the online research study between March 5 and 7, 2019. Quotas were set by age, gender and region to match the general population of the province and as such the data did not need to be weighted. Since the research is conducted online, it is considered to be a non-probability proportion sample; therefore, margins of error are not applicable. However, the margin of error can be estimated to be ±3.5 percentage points, 19 times out of 20 for questions answered by all respondents. Insightrix began developing its SaskWatch Research online market research panel in 2007, using high quality techniques including telephone recruitment and referrals from existing panel members. Presently, there are over 18,500 active panel members representing all regions of the province and distributions of the general population. Panel membership closely matches the 2016 Census, based on age, gender, household composition, household income and education. For more information, please visit http://saskwatch.ca. Insightrix is a dynamic, Saskatchewan-based, full-service market research company. It serves businesses and government entities with insights-driven research solutions, and interpretive analysis through leading-edge tools and senior-level expertise across a broad range of industries. Insightrix is based in Saskatoon, Saskatchewan, Canada. For complete details visit: https://insightrix.com/market-research-industry-blog/.